The NL West-leading Colorado Rockies locked up a playoff berth for the second straight season, beating the Washington Nationals 5-2 on Friday night for their eighth win in a row behind a resilient start from Kyle Freeland. DENVER (AP) — Charlie Blackmon’s bushy beard dripped with bubbly, while Carlos Gonzalez cheerfully soaked up all the spray coming at him from every direction. Nolan Arenado posed for picture after picture as teammates got selfies with him. Now that would really be a party. The NL West-leading Rockies locked up a playoff berth for the second straight season, beating the Washington Nationals 5-2 on Friday night for their eighth win in a row behind a resilient start from Kyle Freeland. David Dahl homered for the fifth consecutive game and Ian Desmond hit a two-run homer against his former team to help Colorado clinch at least a wild card with two games remaining. The Rockies remained one game ahead of Los Angeles as they try to wrap up the franchise’s first division crown. The Dodgers won 3-1 in San Francisco. Colorado can take the NL West title — and end Los Angeles’ five-year reign — with a win Saturday and a Dodgers loss. Wade Davis struck out Bryce Harper looking to end the game and earn his 43rd save. The sellout crowd at Coors Field roared and fireworks went off. Plenty to celebrate: The Rockies are headed to the postseason in back-to-back years for the first time in team history. This is their fifth playoff trip since the franchise began in 1993 — last year, they lost to Arizona in the NL wild-card game. Freeland (17-7) wiggled out of jam after jam on a cool night to finish the season with a 2.40 ERA in games at the hitter-friendly ballpark. The lefty allowed two runs and 11 hits over six innings before turning it over to a staunch bullpen. 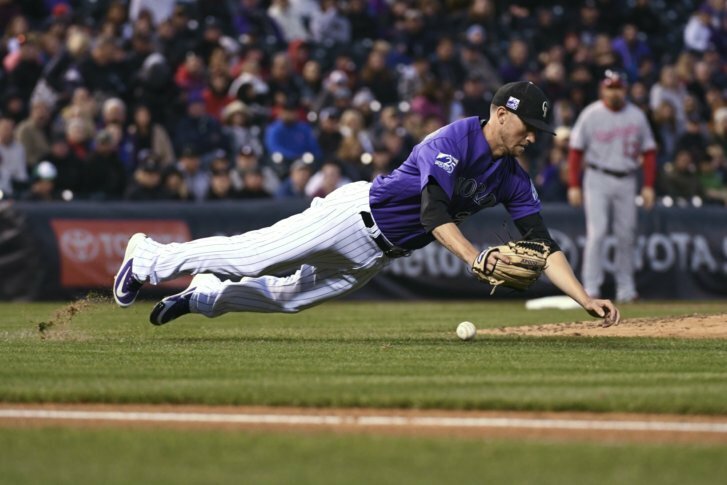 The Rockies’ winning streak is their longest since capturing eight straight in April 2013. During the current streak, the Rockies have outscored opponents by a 57-12 margin. With posters around the stadium billing this as “The Hunt for Rocktober,” the team improved to 18-8 in September. They’re on a quest to end the Dodgers’ five-year reign as division champions. Freeland found himself in trouble quite often, but was able to work his way out of it. His one big mistake was a fastball in the fourth that Trea Turner lined for a two-out, two-run triple to give the Nationals a 2-1 lead. Desmond put the Rockies up 3-2 in the fifth with his 22nd homer of the season. Two pitches later, Chris Iannetta went deep. It was the fifth time the Rockies have hit back-to-back homers this season. With his solo shot in the sixth, Dahl became the fourth Rockies player to homer in five straight games. He joins Dante Bichette (1995), Larry Walker (1999) and Arenado (2015). Freeland finished with a 2.85 ERA overall this season. He joins Marvin Freeman (2.80, 1994) and Ubaldo Jimenez (2.88, 2010) as the only Rockies pitchers who qualified for the league ERA title with a mark below 3.00. Joe Ross (0-2) allowed four runs over five innings in his third start since undergoing Tommy John surgery last year. The party in the Rockies clubhouse was wild, but not too wild for one reason. Nationals: INF Ryan Zimmerman was out of the starting lineup with a sore back and the team plans to take a cautious approach. “I don’t want him to start the offseason worried about rehabbing,” manager Dave Martinez said. Washington will throw right-hander Stephen Strasburg (9-7, 3.77 ERA) on Saturday. But whether NL Cy Young candidate Max Scherzer (18-7, 2.53) starts Sunday largely depends on what’s still at stake for the Rockies. The Rockies will send RHP Jon Gray (12-8, 4.91 ERA) to the mound Saturday against Strasburg, who’s looking to hit the 10-win mark for a fifth straight season.